Super Bowl XXI was an American football game played on January 25, 1987 at the Rose Bowl in Pasadena, California to decide the National Football League (NFL) champion following the 1986 regular season. The National Football Conference (NFC) champion New York Giants (17–2) won their first Super Bowl by defeating the American Football Conference (AFC) champion Denver Broncos (13–6), 39–20. The Giants scored 26 consecutive points during the second, third, and fourth quarters, and a Super Bowl record 30 points in the second half. 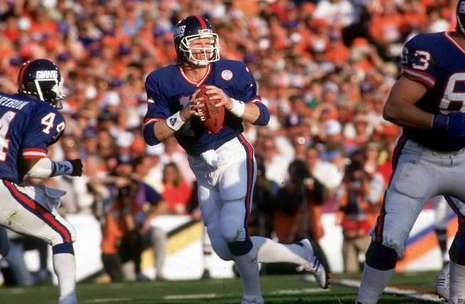 New York quarterback Phil Simms was named the Super Bowl MVP, finishing the game with 22 of 25 passes completed for 268 yards and three touchdowns. Simms also had 25 rushing yards on 3 carries. His 22 out of 25 (88%) completion percentage not only set a Super Bowl record, but also an NFL postseason record for 21 years. The game was broadcast in the United States by CBS and featured the broadcast team of play-by-play announcer Pat Summerall and color commentator John Madden. Brent Musburger of The NFL Today anchored the pregame, halftime and postgame coverage. Helping Musburger were reporters Irv Cross and Will McDonough and analysts Jimmy "The Greek" Snyder, Terry Bradshaw, Joe Theismann and Dan Dierdorf (in his final CBS assignment before moving on to ABC's Monday Night Football for the following season). The pregame show was a salute to California and featured the pop music group The Beach Boys. Singer Neil Diamond performed the national anthem. The coin toss ceremony featured Pro Football Hall of Fame defensive lineman Willie Davis. The halftime show was a "Salute to Hollywood's 100th Anniversary" featuring an introduction by George Burns (who was only nine years younger than Hollywood at the time) and a performance by the Southern California high school drill teams and dancers. Super Bowl XXI MVP Phil Simms was the first athlete to appear in a "I'm Going to Disney World!" television ad. The postgame show was supposed to feature the song "One Shining Moment" but due to postgame interviews taking so long, CBS never aired it. They ultimately changed the lyrics from "The ball is kicked" to "The ball is tipped", and the song is now played at the end of the network's NCAA Men's Division I Basketball Championship coverage. 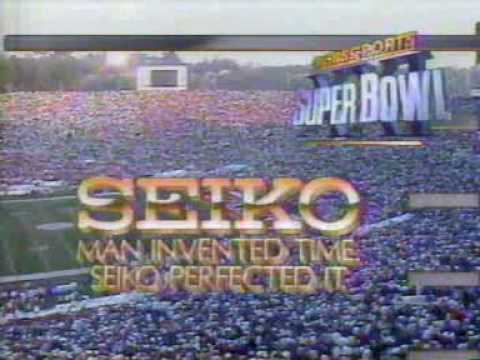 CBS also debuted the theme music that would later be used for their NCAA football coverage during this game.